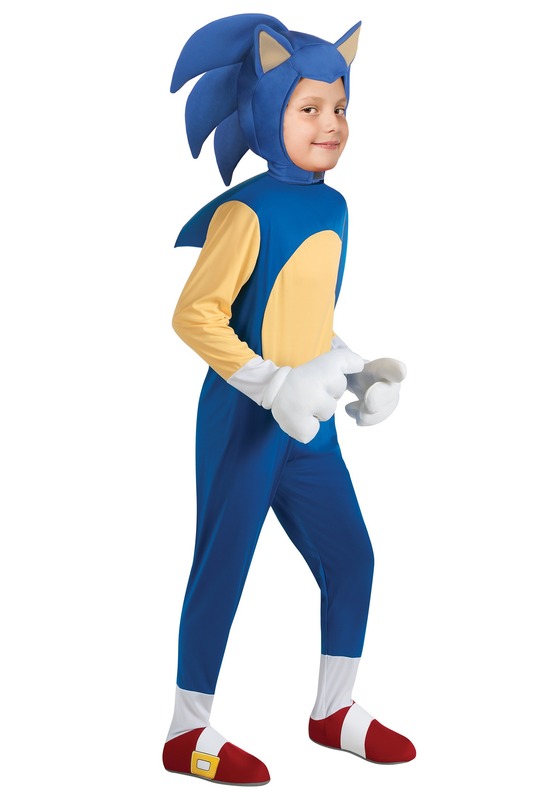 My son was dying for this sonic costume, so I went ahead and ordered it. overall, good costume, but gloves could have been a little bigger ,my son couldn't get his whole hand in it, and the length of costume was too long. Foot covers dragged on the ground and is now all frayed up and ripped at bottom, not sure if will be used next year. But everyone loved his costume including my son who wore it. Definitely does not look anything like how it looks online. bodysuit's material is very, very thin, not as thick as it look online/on the picture. spikes on the back side and on the head piece don't stand up/out as they look on line as well and also the white mittens aren't as puffy as they look online as well. I had to return it one because it was WAY to big for my son, descriptions on the size chart aren't even close on how they describe size by age and secondly also returning because the head piece has a big rip on one side of it, material very cheap. If it were up to me i would have wanted my money back but my son doesn't want any other costume but sonic so i have no choice to exchange to a smaller size. NOT WORTH THE MONEY I'VE PAID.